Welcome to Blue Guitars ‘s web site. Our shop is in Toyama, Japan. We have usually more than 400 items in stock, mainly japanese gear and used/vintage gear. We are glad to take orders from overseas, all over the world. Please,check our collections(stock list). The product page has been price are two types display. 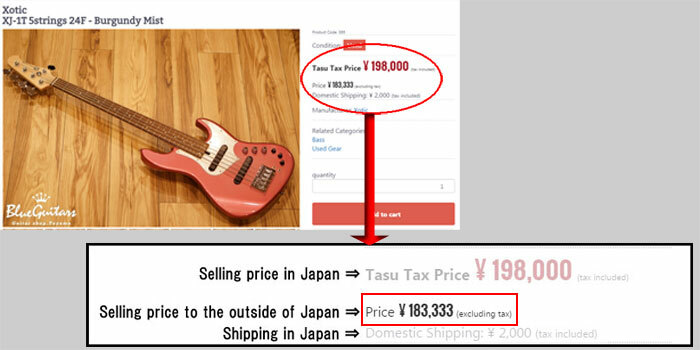 One is the selling price in Japan, the other one is the selling price to customers who live outside of Japan. This is because Japan is the country does not apply the Japanese domestic tax. However customs tax of living in the country is necessary. Please ask to the country of the Customs for more information. Payment You can use PayPal a trusted and proven in the world. PayPal is a convenient [digital wallet] on the Internet. Once you have registered the credit card information to PayPal, settlement completion only in the ID and password. Without having to shop inform the important card information, and more safely can pay. Establishment of the PayPal account is simple as you enter the necessary information to select the PayPal in the settlement method. ⇒ For more information on PayPal is here. Shipping to overseas will use the EMS. ⇒ For more information on EMS is here. Asia 10,500 yen 12,100 yen ask! Products that you purchased in our shop will be the following periods guaranteed by the equivalent of the contents and the manufacturer warranty. With manufacturer warranty products, we will guarantee as described in the manufacturer warranty. Fill in our corporate seal and the date of purchase of the warranty we have been omitted, but please keep it together with the guarantee since it has been described the purchase date on the delivery note. Warranty products to our shop at the time of the repair request, warranty card, please send an invoice. Round-trip shipping Please bear by the customer. Even during the warranty period, he scratches himself customer attached, corruption, Please understand that it becomes the outside of a guarantee in regard such as consumable parts. 1. If you were in normal use, failure in the warranty period (use state in accordance with the notes, such as a user’s manual) will do a free repair. 2. If you failed within the warranty period will receive a free repair, please send it to our top of the enclosed products and guarantee of our issue. 3. even within the warranty period in the following cases will be a fee. Please inquire about the repair estimate. It should be noted, postage please bear by the customer. 4. warranty card, invoice, please keep it in a safe place because we do not re-issued. Initial failure and wrong returned goods other than if the goods have arrived is not received at all. In addition mailing cost at the time of returned goods Please bear by the customer.